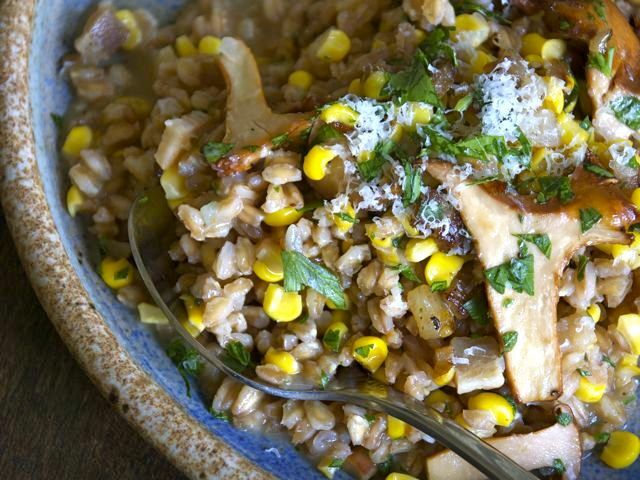 What this "risotto" lacks in creaminess from arborio rice, it makes up with the nutty, earthy flavor of farro. Make this in the fall when fresh corn and chanterelles overlap. Feel free to add more mushrooms if you like; if I'm buying them at the market, I use the lesser amount, but if I'm lucky enough to receive a bagful from a foraging friend, I add more. Heat a large skillet and cook the chopped bacon over medium heat in its own fat. (If the bacon is too lean, thus not rendering enough fat, add a splash of olive oil.) After a couple of minutes, add half of the chopped onion and cook until soft and translucent. Once the onion is soft, add the sliced mushrooms and cook for about 5 minutes, until soft. Stir in the corn kernels, the chopped garlic, a pinch of salt and a grind of black pepper; cook for a couple of minutes, stirring often. Remove from the heat, stir in half of the chopped parsley, and set aside. On a back burner, heat the broth in a covered saucepan; it needs to be hot but not boiling. In a wide, deep pot over medium heat, heat 2 tablespoons of the olive oil; sauté the remaining onion for 5 minutes or so until it softens. Add the farro and stir well; cook this for a couple of minutes, then add the wine and stir occasionally as the farro absorbs the wine. Using a big ladle, scoop about ¾ cup of the hot stock and add it to the farro pot. Stir gently and let it gently simmer until the liquid is absorbed. You don’t have to tend it constantly, but don’t forget about it. In another 5 minutes, add another ladleful of stock. If your stock is growing low and the farro still needs more broth to cook, add water to the pot of broth and bring back to a simmer. Let the farro cook this way for 20 to 25 minutes, stirring with each addition of broth, until it reaches a chewiness/softness you like. Just before serving, add ½ cup of grated Parmesan and the sautéed mushroom and corn mixture to the faro; stir to combine. Garnish with the remaining parsley and serve, passing more cheese at the table.